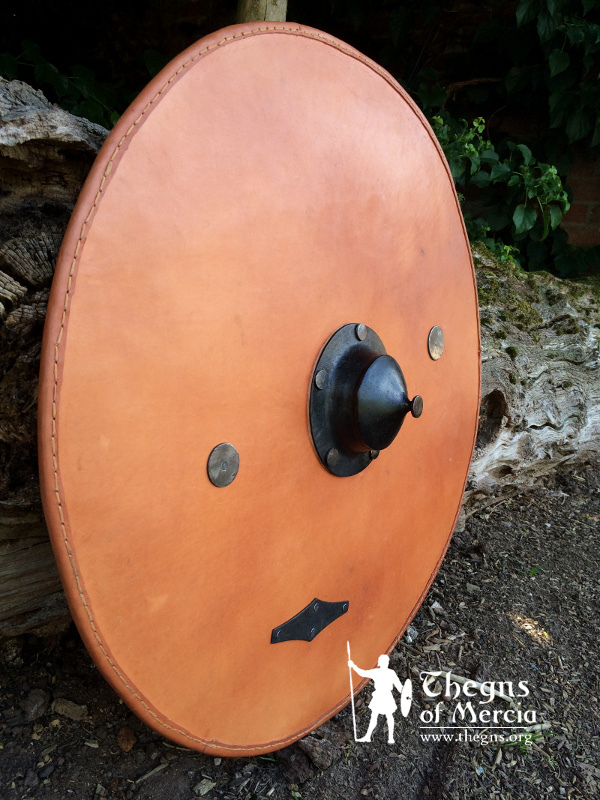 ​In autumn 2017, member Æd Thompson was commissioned by fellow Thegns member Julia to produce a warrior lyre (hearpe) for our mutual friend, Thegns team member and historical musician Connor Sanders. This was Æd's first attempt at luthiery, and, we hope, captures the artistry of the the find on which it is based, and will serve to highlight the importance of music and performance in Migration-Age warrior culture, and the way in which our skilled ancestors applied wonderful craftmanship not just to their now much celebrated metalwork, but also to more rarely preserved organic items. The inspiration for this project was the magnificent lyre from Grave 58, Trossingen, Baden-Wuttenberg, South-West Germany, uncovered as part of emergency excavations in winter 2001/2. During these excavations 12 graves of this late Migration-Age presumed "Alemannic" cemetery were uncovered, of which Grave 58 was the most spectacular; a princely chamber-grave with organic grave-goods remarkably well preserved due to the waterlogging and uniquely heavy clay subsoil. Grave 58 contained a man aged around 40 years old who, thanks to dendro-dating of the chamber timbers, we know was buried in the late summer of the year 580 CE. Strontium isotope analysis revealed he was local to the Trossingen area. He was 1.78m tall and his skeleton showed little signs of physical labour. He lay in a frame bed constructed from beautifully turned beech posts, furnished with red and yellow woollen blankets, and was surrounded by many other sophisticated grave goods, including candle-holders, a turned round table, an elaborate throne, wooden canteen, various bowls, a 3.6m long spear, a bow, a shield of alder, a riding crop and remains of a saddle. A comb lay by his head, a sword (with silver inlaid hilt) lay at his right arm, and at his left was the most perfectly preserved warrior lyre so far discovered. The overall picture is of a high status princely burial that must inevitably be compared to the likes of Sutton Hoo, Prittlewell and Taplow, though with fewer examples of jewellery, and, instead, a great array of wonderful organic items. Trossingen 58 creates the tantalising possibility that other contemporaneous princely graves may have been as, of not more lavishly furnished with beautifully made organic items (in addition to their preserved metallic finds) which have simply not survived. ​Prior to the discovery of the Trossingen lyre, it is fair to say that our understanding of Germanic warrior lyres was largely based on ill-preserved fragmentary remains from various contexts, preserved but isolated components, manuscript depictions, conservatism and sensible conjecture. ​Being so wonderfully preserved, Trossingen provides the first evidence for previously unknown features including sound-holes, and elaborate surface decoration beyond anything we could have dared imagine prior to its discovery. Its entire surface was covered with decoration, including friezes of animal interlace, and processions of warriors carrying shields and spears. ​Our reconstruction, produced over approximately 6 weeks, is overall faithful to the original, though differing in some aspects to account for material limitations. The first lyre Æd had ever made, it was produced following detailed instructions and advice from personal communication with experienced lyre-maker Michael J King (www.michaelking.com). Given difficulty sourcing a large enough piece of Acer campestre wood for the body, we instead used a piece of English lime, having excellent properties for carving and lacking the characteristic "flame" seen on sycamore maple which could obscure the decoration. For the soundboard we sourced a minimally flamed sycamore tonewood (Acer pseudoplatanus - again an appropriate substitute for the original's field maple) though it wasn't quite long enough to allow the sound board to extend all the way up the pillars on the original. We therefore terminated the sound board a few inches lower on the pillars, in a fashion consistent with the design of the remarkably similar contemporaneous lyre from Oberflacht. The body of the lyre was cut, the sound-box carved using chisels, scraped out, and then, importantly, the profile of the body was gradually tapered down to be considerably thinner at the at the string arch than at the base, following closely the dimensions of the original. The sound-board was carefully shaped and sanded, and positioned using ash (Fraxinus excelsior) positioning-pegs as on the original, and finally installed using hot animal-glue. After a week of drying the outside of the lyre was shaped and sanded. The original lyre showed various signs of repair in antiquity, including non-original iron pins used to re-fix the sound board to the body. We chose not to include these so as to give an impression of the lyre when it was first made. Similarly the original lyre had an unusual mixture of ash and hazel pegs, of different design, and it is suggested that some of these were replacements. We chose to incorporate a matching set of ash pegs, corresponding to the spoon-shaped design of the original's ash set, whittled by hand and knife. The bridge was hand-carved, as the original, out of a piece of willow (Salix spp.). ​Recreating the elaborate surface decoration took a substantial part of the time spent on this build, and was undertaken closely following the instructions of lyre-maker Michael J King. This unusual technique - "Kolrosing" - is essentially a means of 'tattooing' the wood, leaving decoration which is totally smooth to the touch and does not remove material or alter the surfaces of the instrument, thereby not affecting its sound. The technique involves finely sanding the surface of the lyre, then incising the design into the surface using a scalpel, in the form of many shallow vertical cuts, removing no material in the process. Charcoal is brushed into these cuts, and the surface is then sealed with an oil or wax and sanded over. As this is the only example of such a warrior lyre where the surface of the body was preserved, it opens up the possibility that other lyres were similarly decorated with this technique, although we will never know for certain. 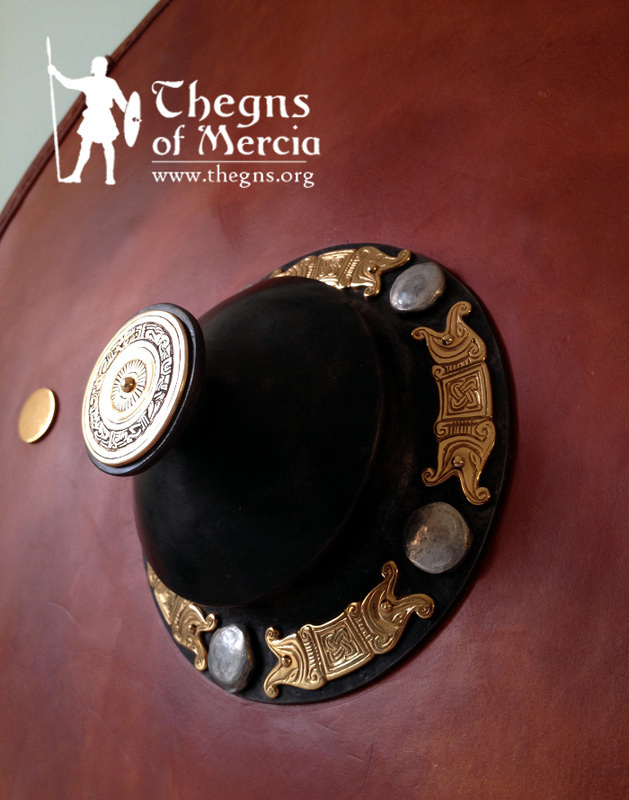 The evocative processions of shield-carrying warriors, all with unique faces, reaching for a huge spear, may be a reference to some story or myth in the owner's oral tradition, and may have served as a visual aid for storytelling in the mead-halls of the 6th century. The decoration on the reverse of the lyre, however - particularly the hugely complex knot work of snakes, must surely be simply an aesthetic indulgence. ​"Dreamgifu" - meaning "gift of music" in Old English, we hope, helps to illustrate the wonderful craftsmanship that those in what we call the "Early Anglo-Saxon period" applied not just in their now much-celebrated metalwork, but also in organic materials. We hope it also highlights the importance of music and performance in Migration-Age warrior culture. It could not have been a more perfect find to recreate for Connor - combining three of his greatest loves; historic music, tattoos, and snakes. 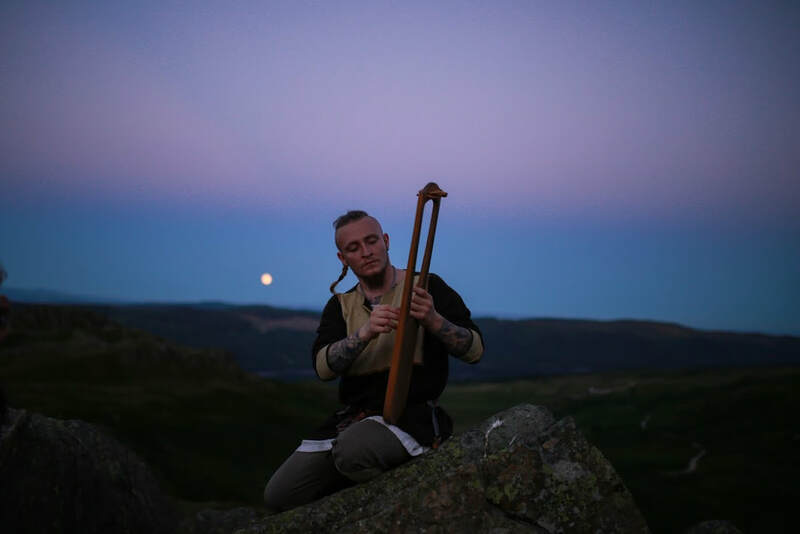 Thegns team member Connor with his lyre "Dreamgifu" - a faithful recreation of the 6th century Trossingen lyre made in autumn 2017 by member Æd Thompson. Photo by Maria Kalinowski. Students of "Dark Age" clothing and textiles will surely be familiar with tabletweave - the tightly woven bands used as strong straps and to decorate clothing. Mineralised remains of textiles with tabletweave structure occasionally show up on the back of brooches, buckles and other metallic items from early Anglo-Saxon graves though it is rare for any fragment to be in sufficiently good condition for any pattern or colours to be inferred. In the late 6th and early 7th centuries CE, a new variant of tabletweave arrived in Britain from the continent; first via Kent and the South coast before spreading north. This lavish new technique - brocading - involved working additional weft threads through a plain-coloured tabletweave as it was woven, to build up an embroidery-like pattern. This paved the way for the intricade brocades popular in the Viking Age, but brocading in the Anglo-Saxon kingdoms in Britain began with metallic brocades, where strips of fine metal - almost foil - were worked through the weave to produce shimmering patterns. 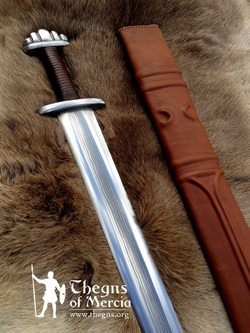 It is thanks to these metal brocades that we can trace the arrival of the technique, for, unlike normal tabletweave, these metal strips (usually gold), with impressions of the threads impressed into their surfaces, survive our harsh soils. The earliest and most abundant examples are narrow bands with simple patterns, from female graves in Kent and the Isle of Wight. These are almost always found near the head, and may have been used as glistening headbands for securing veils. More spectacular are the remains from the famous Taplow princely burial - the second most lavish burial found from the Anglo-Saxon period, which contained, alongside shields, feasting gear and sword, over 2.5m of exquisite, often very wide, finely woven metallic gold brocade. Due to the shortcomings of the 19th century excavators of the burial, the position of the fine strands of gold found in the burial cannot be stated with any confidence, and as such, we cannot say for certain if the huge amount of gold brocade formed the decoration of a cloak or other garment, or perhaps a sword harness or belt. The famous gold Taplow buckle had adhesions of both leather and tablet-weave-structure textile on its back, so it may have been associated with the brocade. Replica, by Aed, of the "narrow band" gold brocade from the Taplow princely burial, early 7th century CE. To illustrate what such a belt may have looked like, and as part of ongoing efforts to recreate and "bring to life" princely treasures from the 7th century, in 2016 we embarked on a project to build a gold brocaded belt inspired by the Taplow burial. The project began with team member Aed learning the gold brocade technique, first experimenting with a narrow band based on one from Chessel Down, Isle of Wight (in blue, at the top) before moving on to the more complex band from Taplow. 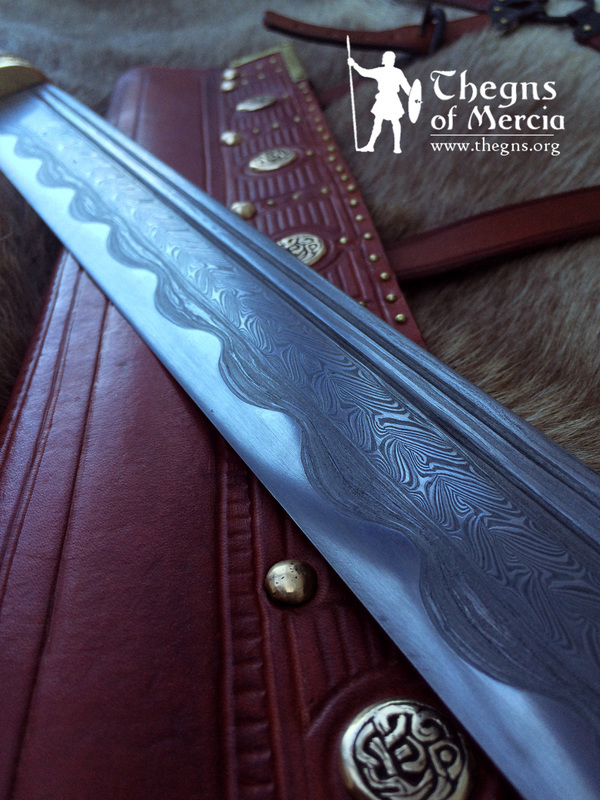 The pattern we chose to reproduce is known as the "narrow band" for it is the narrowest element identified from the burial, although it is still wider and more complex than any gold brocade from any other early Anglo-Saxon burial. The replica band took over 150 hours of high-concentration work. Upon completion it was sewn, using the same threads, to a piece of prepared, stained and burnished veg-tan leather, and the buckle and retaining loops were installed, such that the belt could be clasped without the buckle being covered, or the delicate brocading needing to pass through the buckle or be strained. Rather than the Taplow buckle (a replica of which we had used on a previous build) we chose to incorporate an exquisite replica of the contemporaneous and similarly styled buckle from Alton, Hampshire, produced by Ganderwick Creations. The final result was more subtle than we expected; the gold foil woven through the belt is quite subtle until light hits it at just the right angle and flares, revealing the pattern vividly against the ground weave. It looks particularly good glistening in firelight, and it may have been this that attracted our ancestors to the technique. After all, while coloured tabletweave will appear dull in the dim light of the meadhall, gold brocade glistens and sparkles in light cast by dancing flames. What better assemblage to, along with replicas of finds such as the Staffordshire Hoard, illustrate that the 7th century really was the "Age of Gold"?